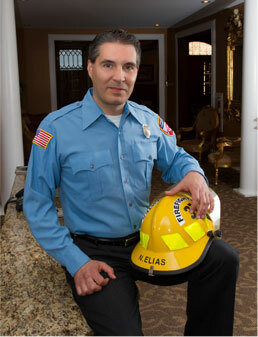 The Nicos Elias Funeral Home is proud to provide any firefighter, EMS worker or law enforcement officer who dies in the line of duty with a funeral or cremation plan free of charge to the family. We also will provide assistance with finding local resources to assist survivors in the rebuilding of their lives. As a local volunteer since 1988, Mr. Elias knows how important it is for everyone to go home after each emergency call. We are proud to provide this benefit to our local heroes. Funeral Plans: all funeral home professional services, transportation and facilities; casket and outer burial container (limitations on selection) will be provided at no cost to the family. Cremation Plans: all funeral home professional services, cremation and urn with personalization (limitation on selection) provided at no cost to the family. Newspaper and cemetery fees, if applicable, are not included. We strive to provide these heroes killed in the line of duty with a respectable tribute worthy of their valor and sacrifice.